While it is possible to clean a pool manually, it is neither fun nor 100% percent effective. The next best option is hiring a pool cleaner which can prove quite costly. You cannot leave the pool alone either because it will become a breeding ground for algae, bugs and all manner of unsafe organisms. That is where pool vacuum cleaners come in. For an above ground pool, in particular, there various options you can choose from. The key is in finding the vacuum cleaner that best suits your pool and will clean it effectively including all the hard to reach spots (Source). To help you with that decision, here is a review of the best above ground pool vacuum cleaners. 7.4 Does The Vacuum Cleaner Need a Cord or Is It Cordless? There are two significant reasons why the Dolphin Escape is a top pick. For one, the above ground pool vacuum is manufactured by Maytronics. Maytronics is a reputable and highly regarded company considered by many to be a global leader in robotic vacuum cleaners. Second, the vacuum cleaner employs an innovative HyperBrush technology. The patented HyperBrush scrubbing mechanism which utilizes dual brushes injects speed and efficiency to the overall functioning of the pool cleaner. Because of the high-functioning brushes, the speed is double that of competing brushes. Regarding efficiency, this mechanism increases the vacuuming power allowing the Dolphin Escape to scrub away even the most difficult to remove sediments and contaminants. The Dolphin Escape uses the SmartNav 2.0 scanning system. The robotic scanning system maps the entire pool and ensures the vacuum cleaner cleans the mapped area. It does not miss spots and can quickly determine a place that is yet to be cleaned. The hyper grip continuous rubber tracks maintain contact with the pool’s surface at all times. This gives the vacuum cleaner a considerable benefit in terms of traction and climbing walls. To improve on bags, the Dolphin Escape uses an oversized filter cartridge for filtration. The cartridge can hold up to 60% more debris, and it helps you avoid messy bags. Finally, one cannot fail to note that the Dolphin Escape has a 24 DC motor which is both powerful and energy efficient. Has an ergonomic frame which makes it easy to handle. Energy efficient thanks to the DC motors. The unit does not come with the fine particle filters required. The cleaner can sometimes lift up when cleaning due to its light weight (14 pounds). 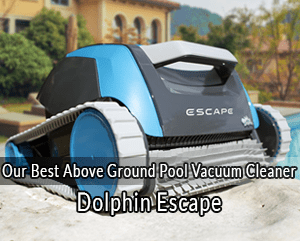 If you are not willing to fork out the money for a robotic vacuum cleaner, then this suction-type above ground pool cleaner is one of the best alternatives. The only reason it is not a top pick is that it requires a decent amount of supervision or manual operation to guarantee it covers the whole pool effectively. The cleaner has an AG disc that enables the Zodiac Ranger to easily slide along the bottom of your pool, to climb up the sides and to move around the steps. That means it can effectively clean the entire pool. In addition, the unique deflector wheel guarantees it will not be caught on ladders, steps or corners. The Zodiac ranger comes pre-assembled, and that means all you have to do is connect the hose and start using the vacuum cleaner for your above-ground pool. It eliminates the headache of installation and makes it easy to use. The one moving part technology eliminates the incredibly irritating flapper noise. As a result, the unit is quiet. A unique feature synonymous with the Zodiac Ranger is the Flowkeeper valve. The self-adjusting valve regulates water flow automatically. As a result, stable water flow is guaranteed, and the vacuum is consistently at peak performance. Please note that the Zodiac Ranger is not ideal for Intex or soft-sided pools. However, regarding above-ground pools, the vacuum works for pools with dished-out bottoms of up to 72 inches. Quieter operation compared to most of its competitors. The vacuum cleaner has a convenient skimmer connection for the hose. The one moving part technology makes it easy to use. No tools or installation knowledge required. The hose is only 32” which makes it a bit of a problem for owners of large pools. Declogging is a must after picking up large debris. The cartoonish exterior makes it is easy to dismiss the Hayward 900 Wanda. In reality, however, thanks to its affordable price, it provides the most value for your money. First things first, it has a patented SmartDrive steering program. The smart steering system ensures the Hayward Wanda 900 does not miss a spot and that it will clean the entire pool thoroughly. The vacuum cleaner works with the existing filtration systems found in most above-ground pools which makes it convenient and less costly because no extra energy-consuming booster pump is required. As the vacuum cleaner moves, it pulls water from the bottom of your pool which enhances water circulation and helps keep your pool cleaner. The unit has a turbine/gearing system which allows Hayward 900 Wanda to move across the pool floor gently. It also provides a balanced water flow and keeps the noise to a minimum. One of its unique features is the deluxe bumper ring. The deluxe bumper ring reduces friction which in turn facilitates natural movement away from the walls. The Hayward 900 Wanda is easy to assemble and requires only ten minutes or less for full installation including the hose. Note that with this pool cleaner, you need to empty or replace the debris bags. It is pocket-friendly, and that means you can own two. The unit has good coverage. Fun design complete with exciting color options. No pool cleaner elicits more mixed reactions than this Polaris Pressure Side Pool Cleaner. Nevertheless, if you are determined to purchase a pressure side pool cleaner for your above-ground pool, then it is one of the best options available. The cleaner is designed for above-ground vinyl pools that are up to five feet deep. It works with the pool’s filtration system to direct powerful jets of water against the pool’s floor. The jets of water loosen debris and quickly deal with hard-to-reach areas. That makes it efficient and ensures it will clean the entire pool. Because the cleaner works on the pressure side of your pump; it distributes filtered and treated water across the pool as it works. It has a detachable debris bag that traps debris as large as leaves and pebbles. The biggest complaint with the Polaris Vac-Sweep is that the hose tangles and coils. However, it is essential to note that the key to keeping the unit untangled is regulating the pressure. That means, if you get the pressure right, it will move slowly across your poll and will not tangle. Consider that if you decide to go for this pressure-side pool cleaner, you need to follow instructions to the letter. It is the only way to ensure it works perfectly. The unit works with an existing filtration system and is thus convenient and inexpensive. The unit comes pre-assembled and is therefore easy to install. The unit requires no manual supervision. The Aquabot X4 is multipurpose because it works with both the above ground and in-ground pools. Voted the “best value robot” it combines rich hi-tech features with a reasonable price. It has an Auto X pool mapping feature that first calculates the pool’s shape and the best cleaning cycle. 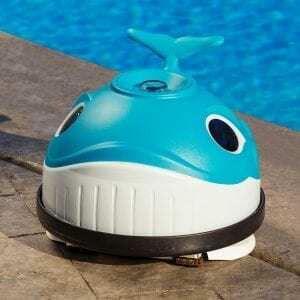 With that determined, the bot can clean the pool quickly and efficiently. 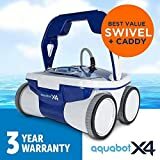 Thanks to the 4WD traction complete with high-grip wheels, the Aquabot X4 has a superior grip, and it effortlessly covers the entire pool including hard to reach areas. The bot has a powerful pump that circulates at 85 GPM. That means it will quickly deal with all manner of particles and sediment even the toughest ones. 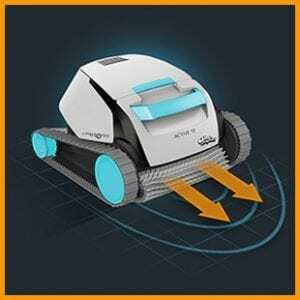 The Aquabot X4 has a control panel that lets you program automatic cleanings by the hour. Once the basket is full and needs emptying, the bot will alert you. This feature allows you to save time because you do not need to monitor the vacuum cleaner. Additionally, the Aquabot X4 runs at only 180 watts which makes it energy efficient. The X4 has an anti-tangle swivel complete with a 360 degrees’ rotation that ensures the robot vacuum cleaner will turn and maneuver without tangling the 60-foot cable. The unit is fitted with rotating micro brushes that facilitate enhanced cleaning. Finally, the unit comes with a caddy for easy transport, and that means you don’t have to worry about moving it from place to place. The robot cleaner is smart and needs no supervision. It is fast and comprehensive in its cleaning. You now know the best vacuum cleaners in the market for above ground pools. However, before settling on one, there are a couple of things you ought to consider. Above ground pool vacuum cleaners fall under three key categories. The Suction pool vacuums are also known as suction-side pool vacuums. Named so because they make use of the pool pump suction power in conjunction with the filtration pump. For them to work; the pool pump must be running. Note that when using this type of pump, you need to clean the filter regularly. On the other hand, the most significant benefit of using a suction-side pump is that they are the most affordable automatically operated vacuum cleaners. Also known as pressure-side vacuums and are considered a bit of an upgrade from suction-side vacuums. Instead of using the pump’s suction power, they make use of the pressure generated by the water flow as it leaves the outlet. The idea behind this mechanism is to ensure the vacuum is not dependent on the pool pump. As a result, the vacuum is bound to be faster. Depending on the brand, the cost ranges from low to mid-range. Arguably, the most efficient but also the priciest. As the name suggests, these are smart pool cleaners that utilize the pool’s circulation mechanism for their power needs. They also have a small internal pump which they use to increase vacuum’s power. 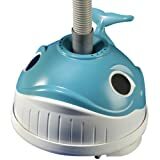 Understanding these types of above ground pool vacuum cleaners and determining which one suits your budget and which one meets all your requirements is essential to purchasing the right vacuum cleaner. Remember that most pools are not smooth. It is vital that you find a pool vacuum that smoothly moves over rough surfaces and can scale the pool walls with no issues. Regarding robotic vacuums, four-wheel drive models are always a plus because of the increased traction. There is nothing as bad as having a pool vacuum cleaner that gets stuck on ladders, corners or stops. It is not only annoying, but it requires physical supervision so that you can keep it moving. Whatever sensor mechanism the vacuum employs, you should ensure it is good enough so that under no circumstances will the vacuum get stuck as it cleans. Does The Vacuum Cleaner Need a Cord or Is It Cordless? Determining whether you prefer a cordless unit or not is an important consideration for two principal reasons. If the unit needs a cord, then you need to ensure the cable is long enough to cover the entire pool without unplugging from the power source. If it is a cordless unit, then the battery should be reliable and able to hold a charge for a reasonable amount of time. Note that other than the mentioned considerations, it is also important that you pick a cleaner with a long-enough warranty. Parts breakdown or refuse to work, without a warranty, you will end up losing money replacing the parts. Some of the vacuums discussed above have up to 3-years warranty. Always consider the warranty when weighing in your decision. With that done, you will end up having the best experience with whichever above ground pool vacuum cleaner you choose.